Charles Jusu, who is over 60, has finally regained his complete eyesight. He is one of the beneficiaries of free cataract surgery being conducted by a team of Chinese medical experts from Hunan Province. His two eyes were almost rendered useless after being affected by cataract for the past years. But with the intervention of the medical team, his eyesight has been revived. “I can now see clearly,” expressed Charles Jusu in local Mende tongue and thanked the team for helping him regain his vision. 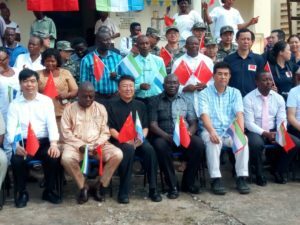 On Tuesday, 6 November, a team of Chinese medical experts in the company of the Chinese Ambassador to Sierra Leone and other government officials launched the free cataract surgery in the township of Kenema, eastern Sierra Leone. The intervention, dubbed the ‘Brightness Trip’ project, was launched in the eastern provincial headquarters, targeting over 200 patients. Aside the surgery, the team donated medicines and medical equipment to the Kenema Government Hospital to help future intervention. Already, 53 surgeries were successfully done before the official launch of the project. The team of six senior ophthalmologists and nurses from Hunan Province would spend 30 days conducting the free surgery. Chinese Ambassador to Sierra Leone, H.E. Wu Peng told the gathering during the launch that the aim of the project was to help people suffering from cataract to regain their eyesight. “We all know that it is a big misfortune to lose the sight in one’s life. We know it brings tremendous happiness to regain the ability to see. In the next couple of weeks, it is exactly this kind of happiness that the Chinese doctors will bring to the Sierra Leonean people,” he said. The Brightness Trip project is sponsored by the National Health Commission of the People’s Republic of China and implemented by the Hunan Provincial Health, Freetown and Kenema Commission, the 2nd Xiangya Hospital of Central University and Hunan Provincial People’s Hospital. 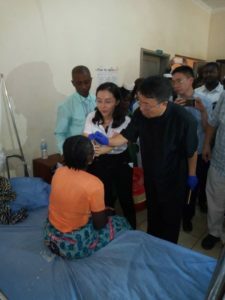 According to Ambassador Wu, they took the project to Kenema for the first time in order to benefit patients outside Freetown, improve the capacity of primary medical institutions and exchange of medical knowledge between the Kenema and Chinese health experts. He reflected on the contribution of China to the public health of Sierra Leone. “We all know that the Chinese Government has dispatched medical teams to Sierra Leone since 1973. In the past 45 years, thousands of Chinses doctors and experts came to Sierra Leone to contribute to medical progress,” he said. The Chinese ambassador expressed that he always felt proud hearing appreciation and thanks from Sierra Leoneans who have benefitted from the interventions of Chinese doctors. 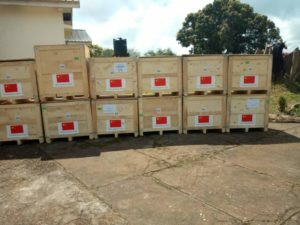 Hunan Health Commissioner, Peng Zhen Guo, said this is the sixth project they have implemented in Sierra Leone, stating that they donated medicines and medical equipment to the Kenema hospital to strengthen its capacity. He reflected on the relationship between Sierra Leone, China and by extension Hunan Province, which dates way back from 1973, stating that many Sierra Leoneans have benefited from various training programmes, ranging from medical to several others in Hunan. Director of Hospitals and Ambulance Services in the Ministry of Health and Sanitation, Dr. Mathew Vandy, noted that blindness could cause poverty and social exclusion, hence the project was timely. He thanked the Chinese government for their intervention in helping people regain their eyesight. Resident Minister East, Andrew Fatorma, expressed delight for the implementation of the project in his assigned region, thus thanking the Chinese government for the intervention. Stressing the lack of maintenance culture among Sierra Leoneans, the resident minister called on the hospital management to take good care of the donated equipment. Like the old man Charles Jusu, all the beneficiaries were in jubilant mood after discovering that they have regained their vision.